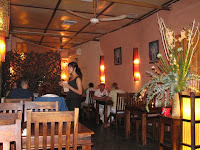 Thai House is one of the fewest places in Tel Aviv which serves good Thai food. The romantically dimmed atmosphere and the friendly waitresses make it a great place to go on a date or just an evening of enjoying good food. 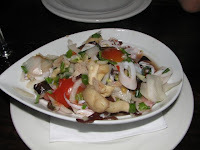 You can start off with some spicy or sour-savoury appetizers, like the calamari salad or the papaya salad we tried. These appetizers make your taste buds get a buzz for the main courses. 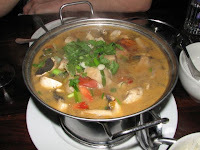 The main courses differ from green or red curries with coconut juice to filling soups like the Tom Yam with shrimps, which is absolutely fabulous! If you don't know what to choose or which dishes go together well, the waitresses are more than willing to help you choose the best combination. The green curry with chicken and eggplants wasn't what you would expect it to be - it is sweet and has a milky taste, and the eggplants itself had a distinctive sweet flavor. But it's worth the try, only because it has the authentic Thai flavors in it. Unfortunately, Asian desserts aren't that special. But we do recommend to try the tapioca with coconut milk. Ask for the banana and mango instead of the canned pineapples, it's refreshingly good. Go all the way west on Bograshov (towards the beach). It's on the corner with Ben Yehuda st.
* Detail: there's an indoor smokers' section in the restaurant on the right of the entrance.